I will be sitting on a panel today in Raleigh, NC. See below. A wonderful association, Benchmarks, is hosting a panel discussion for behavioral health care providers. While it is meant for smaller providers, in my own humble opinion, all behavioral health care providers would benefit from this panel discussion. Senior Counsel, Robert Shaw, and I will be sitting on the panel…with managed care organizations (MCO) representatives. It is without question that I have not been a big fan of the MCOs. If I were to suggest otherwise, I believe that my blog followers would scoff. However, I am interested in hearing these MCO representatives’ side of the argument. Will these MCO reps merely parrot? Or will they truly engage in worthwhile conversations to understand what it is like for a behavioral health care provider in NC today? Feel free to join the discussion at 12:30-2:30. Below is the Evite: 3801 Hillsborough St.
Is Sec. Aldona Wos Challenging the Goliath-Like MCOs? Will She Win? I attended a Women in Leadership conference the other day. The keynote speaker asked for us to come up with a one sentence mantra or mission statement that we would use to describe our purpose in life. I had never thought about what my life purpose is…my career?..being a mom?….being a wife? As a woman, I was torn. Was I a bad mom if I thought my “purpose of being” was my career? Do all women feel this? Was I a bad wife if I thought my “purpose of being” was my career? Does my career define me? I decided that what defines me are the indirect consequences of my career? (i.e., those who benefit from my advocacy, but could never hire me). So my mission statement came out on paper as: I am here in order to advocate for the voiceless. I have a rare opportunity with my career choice to indirectly help Medicaid recipients (the voiceless) by serving the providers who serve recipients. Obviously, Medicaid recipients cannot afford me or any other attorney. But, by serving those that serve recipients, indirectly I am serving recipients. For a more detailed explanation why I love my job, see my blog on Why I Have the Most Rewarding Career. Sometimes, however, my job feels like I am David fighting Goliath. No…the flea on David’s shoe while he is fighting Goliath. In my own head, I have always felt that changing government policy (fighting DHHS) is a true David and Goliath story. Which, finally, brings me to my point. For those of you who have been reading my blogs, how many times have I blogged about MCOs not providing medically necessary mental heath care services??? Or Medicaid recipients being incarcerated or hospitalized because the MCOs were denying mental heath care services? But never have I written that DHHS is not providing the medically necessary mental heath care services, quite frankly, because DHHS has stood back and allowed the MCOs to run rampant. Since the inception of the MCOs statewide, in my opinion and from what I see every day, the MCOs have increasingly taken more and more steps to deny more services, terminate more provider contracts, and recoup more money from providers. And DHHS has taken less and less steps to supervise, oversee or manage the MCOs. By the MCOs increasingly having a “I can do what I want attitude,” and DHHS increasingly having a “I can’t tell an MCO what to do” attitude, when it comes to the MCOs, the MCOs’ power has grown while DHHS’ ability to manage the MCOs has shrunk. 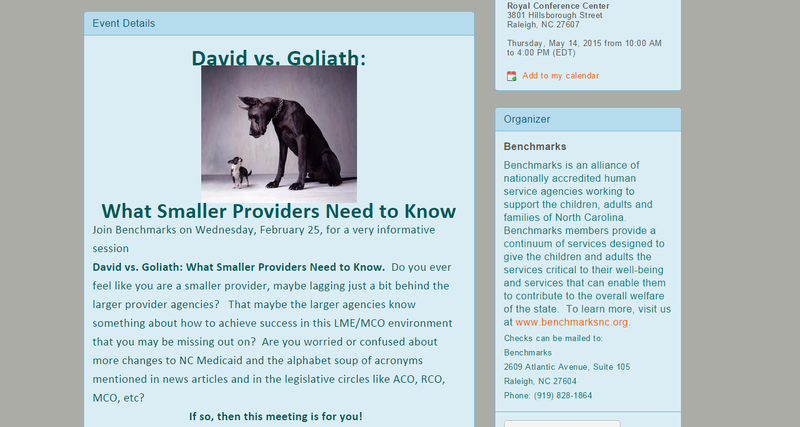 Thus, in the behavioral health care world, the MCOs have morphed into the Goliaths. DHHS is an onlooker, and I am still the flea on David’s shoe. Thereby creating a counterintuitive situation in which Sec. Wos is David and the MCOs are the Goliath. (Normally DHHS would be Goliath). I have written approximately 230 blogs. (really???). I would wager a guess that over half of my blog topics have been MCOs denying medically necessary mental health services or MCOs reaping monetary rewards for terminating provider Medicaid contracts or denying services to Medicaid recipients. The flea on the shoe of David fighting Goliath. But….perhaps….last week….the flea was noticed. Last week the Department of Health and Human Services (DHHS) (actually, Secretary Aldona Wos) announced a new mental health, substance abuse effort. What is that new effort? Whether it was my blog, true statistics brought to her attention, or an epiphany, it does not matter. Bravo, Sec. Wos, but, please follow through. The fact of the matter is if Sec. Wos wants to “reduce the burden on hospital ERs and law enforcement” AND truly provide Medicaid recipients with mental health/substance abuse issues, Sec. Wos will have to take on the MCOs head-on. Grab the bull by the horns. Pony-up. Put your big, boy pants on. Just do it! (Nike). Buck up…against the MCOs. The Goliaths will have to be defeated. Here a little secret: The MCOs have monetary incentive to deny medically necessary mental health services….WHAT???? Shut the front door!!! The managed care organizations (MCOs) in NC are managing behavioral health care services for Medicaid recipients. However, the MCOs are pre-paid. What does that matter? It’s all about the money. For example, a Medicaid recipient suffers schizophrenia with auditory and visual hallucinations. (We will call him Bill). Bill’s psychiatrist, after an assessment, requests assertive community treatment team services (ACTT), which is an extremely high-level mental health service (and very expensive). The MCO denies ACTT services based on “failing to exhaust lesser intensive services” (which is NOT a criterion for entrance criteria, but DHHS is not supervising or managing the MCOs, so who cares whether the MCOs follow DHHS policy). Bill becomes incarcerated. Yes, it is more expensive for tax payers to pay for Bill’s incarceration versus the community based services requested, but it is cheaper for the MCO. The MCO does not pay the prison for Bill’s room and food; tax payers do. The MCO is successful in keeping its money. Similarly, Bill becomes hospitalized. The hospital admits Bill into Butner or Holly Hill. Sure it is more expensive for tax payers to pay for Bill’s stay at Butner or Holly Hill, but it is cheaper for the MCO. The MCO does not pay Butner or Holly Hill; the tax payers do. The MCO is successful in keeping its money. But, according to the Press Release from DHHS, Sec. Wos wants to stop the MCOs from pushing the mentally ill to prisons and emergency rooms. But in order to stop the MCOs, she will have to stop the Goliaths (MCOs). Interestingly, everyone always thinks of David as the underdog to Goliath and, therefore, is surprised/excited when David beats Goliath. In reality, according to “David and Goliath: Underdogs, Misfits, and the Art of Battling Giants,” a book by Malcolm Gladwell, David was not the underdog. According to Gladwell, Goliath suffered from acromegaly or, more commonly known as, gigantism, which can cause people to grow to abnormal heights. People who suffer from acromegaly, usually, also suffer other symptoms, such as poor eyesight and mobility. Yes, Goliath looked scary and big, but, in reality, he may have been slow and somewhat blind. Remember his words to David? “Come to me so that I may feed your body to the birds of the air…” “Come to me.” As in, I cannot see you yet. Come closer. Furthermore, David was a trained “slinger.” As in, the person in battle back then who did not wear armor and who became skilled at slinging rocks at high speeds to kill opponents. Imagine a major league baseball player with a fast ball of 100mph throwing the ball directly at your head. David was a shepherd, and he became a master with the sling to kill the wild life attacking his sheep. Back in biblical times, being large, massive and heavily armored against a master slinger would be like bringing a butter knife to a gun fight. Goliath had no chance. David was smart. Sec. Wos will need to be smart too, maybe even a master slinger. Recommend and establish community partnerships to strengthen the continuum of care for mental health and substance abuse services. Promote education and awareness of alternative community resources to the use of emergency departments. Make recommendations related to data sharing to help identify who, when and where people in crisis are served, and what the results of those services are. Create a repository of evidence-based practices and provide technical assistance to Local Management Entities/Managed Care Organizations (LME/MCOs), law enforcement and providers on how to respond to crisis scenarios. Recommend legislative, policy and funding changes to help break down barriers associated with accessing care. The prisons should be ecstatic too. Herein lies the problem…the MCOs are, most likely, NOT ecstatic. Sec. Wos, by announcing this crisis solution, has placed her hand in the MCOs’ cookie jars. Can you imagine the backlash by the MCOs if Sec. Wos actually followed through with this crisis solutions? In order to follow through with the crisis solutions, Sec. Wos will have to force the MCOs to authorize medically necessary mental health care services. With more services authorized, there will be a greater need for providers who accept Medicaid; thus reducing the number of terminations of provider’s Medicaid contracts. Because if Sec. Wos wants, as she stated in the Press Release, to stop the revolving doors at the hospitals for the mentally ill, Sec. Wos has to take on the MCOs. DHHS will have to do its job and supervise/manage the MCOs. But can David be smart enough? Or will the Goliaths prevail? This is EXACTLY the issue that I have been blogging about for months. The State of North Carolina, for whatever reason, has determined (whether intentional or not) to decrease the number of behavioral health care providers who accept Medicaid. With the aggressive tools in the Division of Medical Assistance’s (DMA) work shed, such as outrageous Tentative Notices of Overpayments, capricious prepayment review audits, and arbitrary terminations of Medicaid contracts without affording due process, DMA has, in the last year or so, successfully bankrupt hundreds of Medicaid behavioral health providers. Or the providers simply washes their hands of Medicaid all together. With the dramatic decrease in Medicaid mental health providers, where are all the Medicaid recipients going? One answer? The ERs. People in the industry are also noticing. My best friend is an ER nurse. She told me recently that she noticed more and more patients coming in to the ER with mental illness the primary diagnosis. I asked her whether she knew whether these patients with primary mental health diagnoses were Medicaid patients. She answered (which I love), “I don’t know. I never look to see if a patient is a Medicaid recipient. I treat them all the same.” She is a good nurse. Anyway, I asked her to start paying attention (without ever providing me with specific information). She returned a week or so later saying that, yes, the patients with mental illness as the primary diagnosis generally seem to be Medicaid recipients. (In fact the night before a man came in the ER sticking his tongue in and out rapidly and screaming, “Get me my lily pad!” This is not a man who should be in the ER. This man should be receiving mental health services). 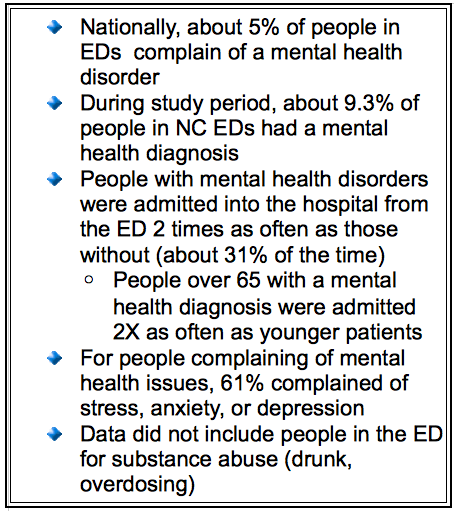 Research published by the Centers for Disease Control and Prevention compared rates of people reporting to North Carolina’s emergency departments complaining of mental health issues to EDs in the rest of the country. Many people think of emergency departments as mostly treating patients with traumas or heart attacks or an out-of-control infection. But in 2010, Judy Tintinalli, an emergency department physician at UNC Hospitals, was getting the sense that she was seeing more and more patients coming into her emergency department with mental health problems. She started asking around and found she wasn’t the only one with this impression. “We’d all noticed that the number of mental health diagnoses in visits are just going up in EDs,” Tintinalli said. “And this has been going on for a while.” Source: Emergency Department Visits by Patients with Mental Health Disorders — North Carolina, 2008–2010, MMWR 62(23);469-472 So she and her colleagues from several states started work on a study to look at rates of people coming in for care with mental health issues as one of their main complaints. Tintinalli’s intuition was on target. In a paper published last week, she writes that while rates of mental health issues in emergency departments are up all over the country, they’re especially high in North Carolina. Patients who came to emergency departments in the state between the beginning of 2008 and the end of 2010 were twice as likely to have a mental health complaint than in the rest of the country. According to the Centers for Disease Control and Prevention, in 2009, about 5 percent of people coming into emergency rooms had a mental health disorder. But at that time, North Carolina’s rate was almost double, according to Tintinalli’s study. 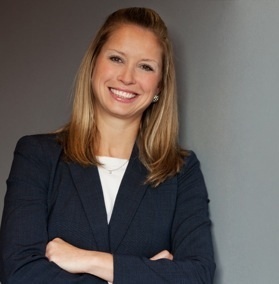 She used data that comes from almost every emergency department in the state, a system called the North Carolina Disease Event Tracking and Epidemiologic Collection Tool (NC DETECT). The system, begun as a way to catch bioterrorism or disease outbreaks before they get out of control, collects data about the diagnoses of every visitor to North Carolina’s emergency departments. 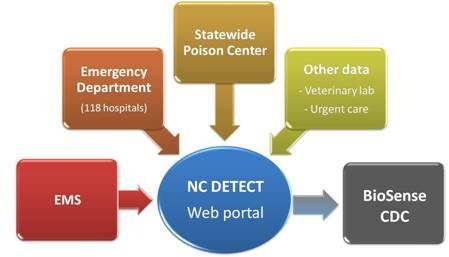 NC DETECT captures more than four million emergency department visits per year. No personal data is collected, just geographic data and information about what happened during the visit. The system collects up to 10 possible diagnoses for each patient encounter. “And at the end of the patient encounter, you list the diagnoses the patient had,” Tintinalli said. “You prioritize based on how critical they are. “So, say you have someone come in with cancer, and they have pneumonia, and they’re also depressed; depression is the third diagnosis. If you come in saying you want to kill yourself, then the depression will be the first diagnosis.” By the end of 2010, 9.3 percent of all ED visits had a mental health problem as one of the top complaints. And Tintinalli found that not only were people coming in for mental health disorders, but those people with a main complaint of mental health problems were more than twice as likely to be admitted to the hospital. No surprise. Clinical social worker Bebe Smith, who teaches at the UNC School of Social Work, said she wasn’t surprised to hear that North Carolina has had higher rates of emergency department usage among people with mental health issues. “North Carolina’s mental health system has been in constant flux for over a decade,” Smith said. “Sometimes people end up going to the ER when they’re truly suicidal and despairing and overwhelmed by stress. You know, if there are psychosocial stressors like losing a job, you don’t want to go on, you start drinking, get suicidal,” Smith said. She said it’s called being “in crisis,” and it looks slightly different for each patient. Tintinalli’s data showed that close to two-thirds of people coming in with mental health problems were complaining of stress, anxiety or depression. A lot of providers of care for people with severe and persistent mental illness, like schizophrenia or bipolar disorder, have gone out of business, Bebe Smith said. And when that happens, patients lose their continuity of care. “That’s something important for them,” she said, “and it’s something we’ve lost.” She also said that the state has shifted away from continuous provision of care for these people – who often are disabled enough to have Medicaid –into episodic care, as a way to save dollars. “So people might have been in treatment for a while, they do better and then we discharge them,” Bebe Smith said. She said many outpatient clinics have pushed providers into seeing more patients for shorter visits as a way of getting productivity – and revenues – up. Then if patients start to do poorly, they get lost. “So if someone misses the appointment, they don’t have time to check in on that person. But the people who are doing more poorly are the ones who need outreach,” Smith said. “The way they’ve pushed productivity levels on therapeutic workers – that’s another place where you lose the continuity that’s key in keeping people from crisis.” So, she said, many end up in the facility of last resort – emergency departments.